Have another ingrown hair ruin your day? Stressed out about shaving because of your raw skin and tender redness? Many products exist to help alleviate some of the struggle from hair removal, but none does it with as much variety as Tend Skin Liquid. Tend Skin liquid can be used in a multitude of different scenarios, all of which equally important in taking care of and showing off healthy skin. Definitely worth the $16 price tag, you can use the liquid for ingrown hairs, razor bumps, waxing, laser hair removal or reducing redness from shaving. First off, you only need a thin coat of the liquid. You should never consider overdoing the amount, as the thin coat was intentionally chosen as the best means to sit on the skin’s surface and “out” of any newly treated follicles which could be tender after a shave. 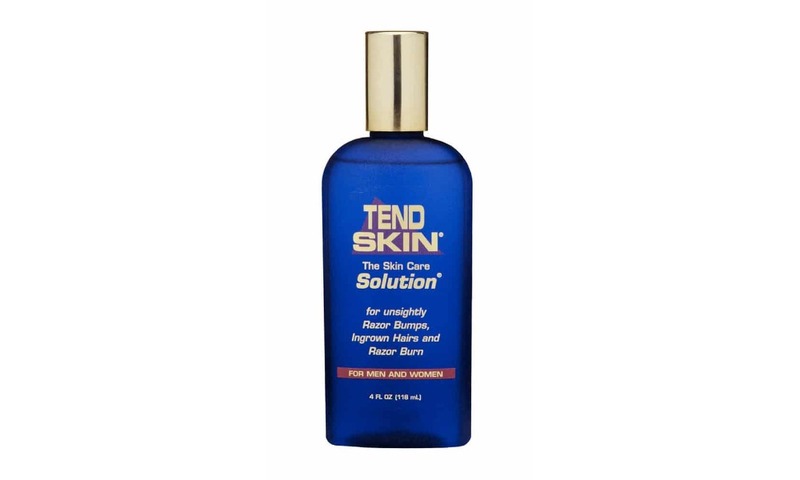 One of the key perks of Tend Skin Liquid is its ability to help reduce the appearance of existing ingrown hairs. These hairs are formed after improper removal below the skin surface, resulting in hair that curls over within the follicles and doesn’t exit the skin smoothly. Ingrown hairs often come as a result of shaving, similar to the dreaded razor bump. These bumps can occur on the neck, faces or scalp area of men with curly hair, resulting in itches and a deep burning sensation. Luckily, Tend Skin Liquid can cover these marks as well through applying the liquid to razor bump ridden areas, working to reduce any unsightly appearances. You may also want to apply the liquid independently of shaving at night, as it can work overtime to cleanse your face of undesirable features while you are sleep. Occasionally after you shave, one might start to notice a bit of razor burn. Tend Skin Liquid also acts as a means to reduce the redness surrounding previously shaved areas, calming down the skin and reducing the amount of wait time before a healthy look again. If you are aiming to avoid irritation in general, but sure to change your blades frequently. The number of shaves you can get with your blade varies by brand, but it is important to keep a lookout on old razors which could scrape and irritate your skin. However, if you are the type of person that prefers waxing their hair off instead of shaving, then you are all too familiar with the possibility of burns or ingrown hairs. Tend Skin Liquid can actually be used before a waxing, causing the hair to cooperate easier with the wax and reduce chance of burn. Applying the liquid after waxing also works, helping to reduce redness in affected areas once the waxing is complete. The extensive ability of Tend Skin Liquid continues to impress as the user can also apply the liquid as deodorant, working exceedingly well for underarms. Perhaps you’d like to try a new remedy for foot odor, as the liquid may also be applied before putting your shoes and socks on, as well as when you remove your shoes. Do you often have to wear a tie to work and are subject to the possible redness of it rubbing against your neck? The liquid’s ability to remove redness can be applied nearly anywhere, including the neck during any uncomfortable shirt situation. Shaving is a consistent part of every man’s life, so you owe it to yourself to be invested in improving that process. The reduction of raw skin from shaving is crucial to not only look great, but feel comfortable with your own look.